With greater dispersion than diamond, sphalerite is an intriguing, yet challenging, gem. 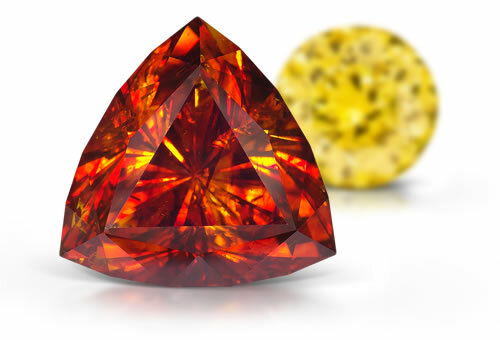 Known primarily to collectors due to its lack of hardness, sphalerite can try the patience of even the most highly skilled lapidaries who dare to fashion it into a finished gem. Not only is it extremely soft, it also has perfect cleavage, in six directions, making it extremely difficult to cut and polish! Add in the fact that it's a brittle gem, and you have an idea of the challenge that awaits its potential cutter. When that talented lapidary is, however, able to complete his task with a fashioned gem, the results are more than worth the lapidary's efforts! SR nature, magnification, cleavage, spectrum, very strong dispersion, SG and possible fluorescence. Cleiophane can range from nearly colorless and pale yellow to light green. Marmatite is the black variety usually found in Marmato, Italy. Ruby Blende is the red variety of sphalerite. Stones are rarely chatoyant. Sphalerite is frequently color zoned and has very strong dispersion.